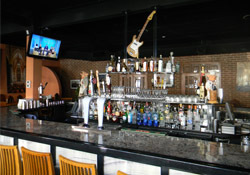 Zesty's is a trendy restaurant /lounge located in Manayunk. With an intimate atmosphere, delicious Greek inspired cuisine and a full service bar with 6 high definition TV's and two supersize projector TV's. Zesty's is a staple in Philadelphia night life. The restaurant boast a full weekly schedule ranging from live music, DJ, karaoke and special promotions with daily drink specials. Happy Hour (5:00 pm - 7:00 pm): Half off appetizers, $4 house wines and lagers, $5 glasses of sangria and mojitos, $5 cocktail of the week.